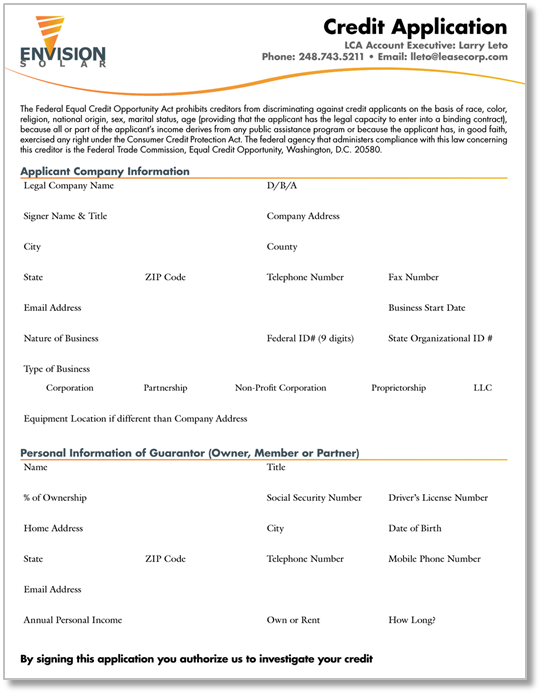 For your convenience, we have developed an Online Credit Application. Click below, fill in all required fields, sign electronically and hit submit. Your application will be reviewed immediately and you will receive an answer in as little as a few hours. Envision Solar International, Inc. is a San Diego-based sustainable technology innovation company. Envision distinguishes itself with unique and advanced renewable energized electric vehicle (EV) charging, media and branding and energy security systems. Envision’s highly valuable and diverse product portfolio is based on its patented EV ARC™ and Solar Tree® product lines. All products can be enhanced with EnvisionTrak™ patented solar tracking, ARC Technology™ energy storage, SunCharge™ EV Charging Stations and digital advertising packages. Financing equipment allows businesses to get the equipment they need without affecting bank or credit lines. No matter the type of business, you need the proper equipment to efficiently compete and flourish. That’s why Lease Corporation of America provides financing options for Envision Solar International, Inc.: so your business can reach its full potential.